It digitizes and can replace a credit or debit card chip and PIN or magnetic stripe transaction at a contactless-capable point-of-sale terminal. The integration of Apple Pay with your Spree Commerce store can be done quickly and easily following the guidelines mentioned below. Apple Pay provides an easy and secure way to make payments in your iOS apps, watchOS apps, and websites in Safari. It can also be used in Business Chat and in iMessage extensions. By using Face ID, Touch ID, or double-clicking Apple Watch, users can quickly and securely provide their payment, shipping, and contact information to check out. Customers love the simplicity of Apple Pay. Apple Pay is available in the United States, United Kingdom, Canada, Australia, Brazil, UAE, Russia, China, New Zealand, Singapore, Japan, Taiwan, and Hong Kong, as well as various other European nations. Apple Pay supports most major credit cards or debit cards, including American Express, Visa, Mastercard and UnionPay etc. More than 1 million credit cards had been registered on Apple Pay in the first 3 days of its availability, making it the largest mobile payment system in the US at the time. With the launch of Apple Pay in China, the service hit three million provisions inside its first three days, while, more generally, it is adding one million new users per week worldwide. Spree offers out of the box Apple Pay integration using Stripe and Payment Request API. Apple Developer Account. To process Apple Pay transactions you need to receive a Payment Processing certificate which you can get once you enrolled in the developer program. A reserved domain confirmed with your Payment Provider or Apple Pay (Refer to your Payment Provider documentation). SSL connection to a server (including development environment). Tools like ngrok or localtunnel might come in handy here. A device eligible for Apple Pay and a Sandbox Tester Account. Or Xcode’s Simulator. If out of the box experience is not satisfying all your need — you can make your own on top of Spree fairly easily. Check out this Apple Pay guide for more details about custom implementation. 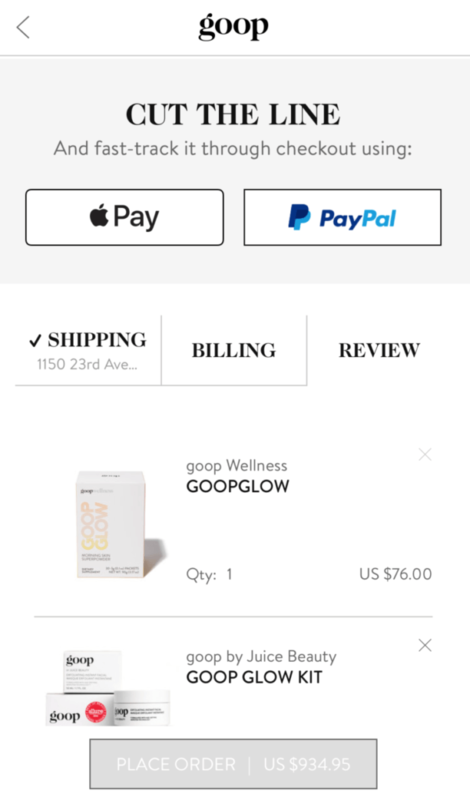 Goop originated as Gwyneth Paltrow’s homespun weekly newsletter. Now it’s an eCommerce platform that brags over 1 million monthly unique viewers. It is built with Spree and uses Apple Pay as one of its payment methods.